Heritage Le Telfair a member of the Small Luxury Hotels of the World is exceptional in many ways butler service in Suites luxurious rooms a Seven Colours Spa Millesime Collection a plethora of land and water sports a Timomo and Friends Kids club a wonderful selection of 8 restaurants including the GinJa - a Pan Asian Fusion restaurant the main restaurant Annabellas the Chateau de Bel Ombre and privileged access to the Seven Colours Energy Cuisine and the Infinity Blue at the neighboring resort Heritage Awali Golf and Spa Resort. Named after the famous naturalist Charles Telfair who lived in the area in the 19th century the Heritage Le Telfair Golf and Spa Resort nestled at the heart of the Domaine de Bel Ombre on the unspoiled South coast of Mauritius immerses its guests in a very special atmosphere embodying the charm and romanticism of yesteryear. All rooms and suites have beautiful sea or river views with floor to ceiling French windows private balconies or verandas. Named after the famous naturalist Charles Telfair who lived in the area in the 19th century the Heritage Le Telfair Golf and Spa Resort nestled at the heart of the Domaine de Bel Ombre on the unspoiled South West coast of Mauritius immerses its guests in a very special atmosphere embodying the charm and romanticism of yesteryear. Please see the rate rules. Largest Meeting Room Size: 1012 sq. ft. It is a beautiful property, nice views and awesome food. What else one wants. A millionaire experience! Staff are unbelievably friendly and efficient. Seriously recommended! It's just heaven! We love it here and the hotel service has been amazing! They are trying to do the best for us and to have the most gorgeous and beautiful honeymoon. We recently spent five nights at Heritage Le Telfair and I really cannot think of a negative point to make. Our room was so comfortable and relaxing. The selection of restaurants meant that we did not have to eat in the same place twice, and we honestly did not have one bad meal. I have to give a special shout out to the breakfast, which was truly wonderful. Without exception the staff were friendly and courteous and did everything to ensure that our stay was everything we wanted it to be. We will definitely be back! 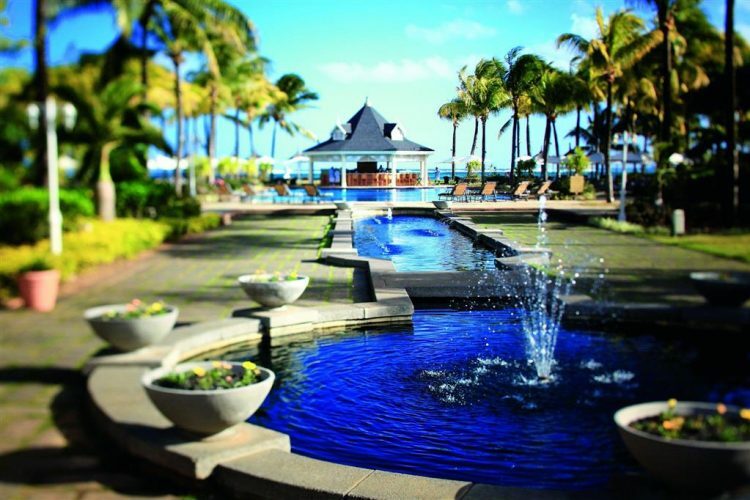 Heritage Le Telfair Golf & Wellness Resort is my favorite hotel in Mauritius. I went there many times and the suites, the staff, the services and the restaurants are always excellent. The atmosphere is great, with the beach, the lagoon and the nature. This hotel has about 5 restaurants and all are excellent and each offers a different variety of food. My favorite one is the Le Château de Bel Ombre (excellent food and amazing building). The services are excellent thanks to a professional and friendly that does everything to help you and to organize perfect holidays. The golf is excellent and the rooms will (or have been) recently renovated. The only thing to improve is the dive center, which is not very good and shared with another hotel. Recently refurbished. Quiet hotel for relaxing . The best place ever! Heaven! Very Nice Viewing, Nice Service, Nice Hospitality. And Good restaurants, Good Sea! Warm welcome from employees. Great service! Very nice resort with good amount of fun activities but all meals were entirely too expensive for what you get. One of the most beautiful properties in Mauritius. Sea side hotel with a wide beach, sprawling green golf course and helicopter rides! We stayed at the Telfair hotel for 4 nights, very good service, friendly staff, good breakfast, yoga, tennis, wakeboard, canoe included. I would highly recommend it to my friends ! I simply loved my stay here. Its super luxury & classy! Stayed 3rd May to 8th May. Had a brown water problem at Heritage Awali, so got moved to Heritage LeTelfair. Also got upgraded to Gourmet Bliss for trouble as our room had to be downgraded due to move. Stunning place, and 500 star service. Food selection and preparation should be better though. Irritating that on the Gourmet Bliss, there is a surcharge for a few items. 3 star review because we had to complain about extra charges on two occasions and where there was an unfortunate incident with the TV, our fault, they have not provided any evidence to support the charge. Also the brown water at Heritage Awali was ridiculous and it took two days for management to action. The Hotel is very amazing--especially the ANNABELLAS and the Cavendish -Bar🍸👍--a very good staff is working in this Place--it can be a Five star superior 😘🌞😊😉!!! Beautiful experience. Staff goes an extra mile to make stay a special one. One of the best hotels in Mauritius, enjoyed a lot for three days.